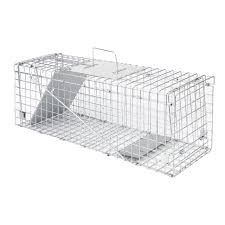 Cat Trap - Humane Live Catch Cage Trap is a no harm method of catching and trapping problem, stray or feral cats. This is an easy to set trap made of rust proof, galvanised steel giving it long life use. Our Cat Trap has a spring loaded door and once a cat steps on the treadle plate to reach the food bait beyond the door closes immediately.